Engraved beer mugs are a fantastic way to toast your group of friends or say thank you for a job well done. With personalized gifts from Frederick Engraving, you can make any occasion even more special. Our available products include a selection of monogrammed beer mugs, each tailored to your specifications to make them perfect. Pilsner glasses and mugs are ready for your personalized touch, whether it’s a single initial, a full monogram, a name, or a few lines of text. Our high-quality engraved beer mugs are etched with precision and require no extra care or maintenance – they are even dishwasher safe! They make great gifts for birthdays, beer tasting events, bridal parties, or anniversaries. You can even create a set to act as your in-home barware! 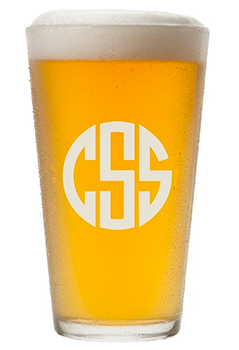 Designing monogrammed beer mugs with us is easy. Just find the glass you love online, choose a monogram style or font, enter in your text, and you’re ready to go. Our helpful customer service reps will be there along the way if you need assistance, always friendly and ready to answer your questions. Engraved beer mugs add a fantastic personalized touch to any gift or event and can be enjoyed for years to come. Whether used for a special gift or as party favors, consider etched glassware to make your present unforgettable. Browse our online inventory to find the perfect item to engrave today! A personalized touch can go a long way in making that special someone feel just that way – special. Shop Engraved Beer Mugs Now !